A few years ago the U.S. government established a program called ‘cash for clunkers.’ Essentially, the idea was to provide economic incentives to U.S. residents to purchase a new, more fuel-efficient vehicle when trading in a less fuel-efficient vehicle. The program was moderately successful. 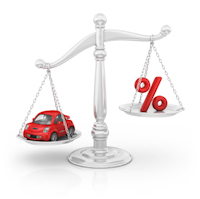 Chapter 13 provides a huge benefit for people with older car loans. Through Chapter 13, you can ‘cram down’ the total car loan to match the current market value of the car. For example, if you own a car worth $5,000 but your loan balance is $10,000, then you can cram down your loan to $5,000 (the value of the car) through your Chapter 13 repayment plan. The remaining $5,000 of the balance will be lumped in with your other unsecured debts (like credit cards). This means you’ll likely pay only a percentage of that unsecured debt, and the remainder will be wiped out at the completion of your plan. This means you will end up owning the car free and clear at the end of the bankruptcy. The only catch with this is that your loan has to be over 910 days old (about 2 1/2 years). So- if your car is older and you are facing financing difficulty- then Chapter 13 may be a good option for you. Call today for a free consultation to consider your options.